More and more people are looking to build a Tiny House. The pressure to escape bureaucracy and to have a home that is off the grid is becoming more and more the choice. EnviroPro has the solution for people desiring to do this. You can finally be self-sufficient, and live off the grid in a financially and environmentally friendly way. Compact, Small Size, Waterless, Low Environmental Impact. The Nature's Head© is being used by many because of the ability to be easily relocated and it's simplicity to install. 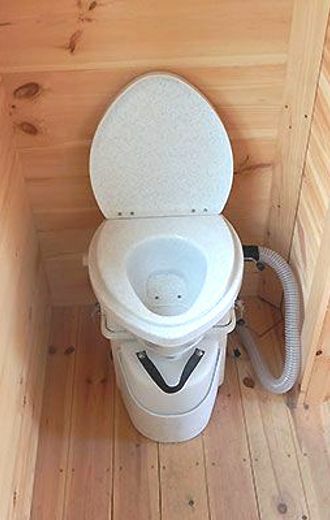 The small size, ease of installation, and reliability of the Nature’s Head© has earned it the “first choice” for those looking for a composting toilet for the tiny house they are building or considering. The waterless design requires no water for flushing which not only requires no plumbing, but is also eco-responsible. There is no odour, due to the separation of liquid and solid wastes. The Excelet is also a good solution for a Tiny Home. The Excelet range is designed to provide toilet facilities for low use situations at a low price. 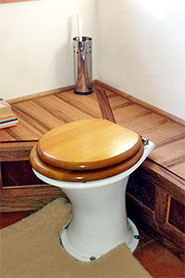 Unlike most composting toilets, the Excelet sits on the toilet room floor and requires no space beneath it. As such, it suits people who are unable to install a composting chamber beneath their bathroom floor due to their home being built on a slab. 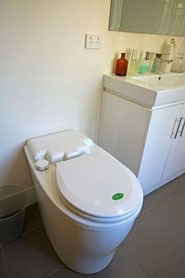 The Excelet is shaped to resemble a modern flushing toilet, although it is larger with the seat 10 cm higher than standard seats. Where people have built a Tiny House with an under floor clearance of at least 450mm, it is possible to use the Classic 750. The benefit of this option is that you only have the pedestal inside the home, but all the rest of the unit is located under the floor. Where people have built a Tiny House with an under floor clearance of at least 650mm, it is possible to use the Classic 650.